Jodo was developed by Muso Gonnosuke about 400 years ago. The story goes that Muso Gonnosuke challenged the famous swordsman Miyamoto Musashi to a duel (with wooden swords) and was defeated but, as was rare in those days (and even rarer for Musashi), Gonnosuke was allowed to live after his defeat. Gonnosuke retreated to a Shinto shrine and focussed his efforts on meditation and practice with the Jo (staff). After much practice and experimentation he developed a style of fighting that merged spear-fighting and swordsmanship (kenjutsu), he named this combat form Shindo Muso Ryu and, when he was ready, Gonnosuke challenged Musashi again. This encounter went in Gonnosuke’s favour. He was able to defeat Musashi’s Nito Ryu, two sword technique with blocks and penetrating strikes and at the end of the encounter he repaid his debt to Musashi by letting him live. Gonnosuke is reported to have developed only twelve or so basic techniques of blocking and striking initially and this number of techniques was grown to number over seventy. These techniques form the basis for modern day Jodo. Jodo today is practised through paired kata with one person using a Jo (staff) and the other a bokken (wooden sword). The moves of the kata give the practitioner and education in focus, range, balance and grace. Jodo is also quite a good workout when doing the advanced forms! 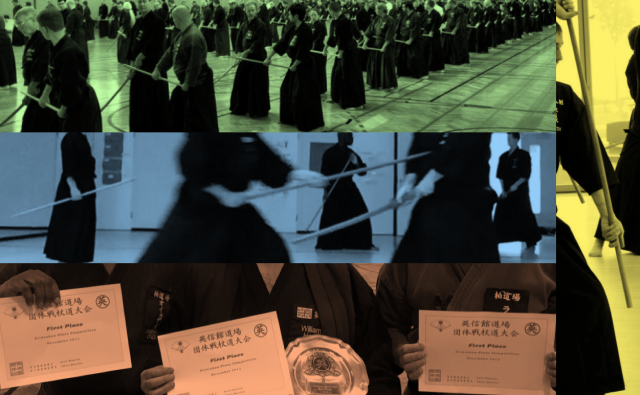 At Kashiwa we study All Japan Kendo Federation (ZNKR) jodo and our koryu (old style) is Shindo Muso Ryu. ZNKR Jodo: A set of 12 standardised kata created and refined by the ZNKR. These kata are used in gradings and most competitions (taikai) and are taught to a standard throughout the world. Shindo Muso Ryu Jodo: Originating from early 17th century Japan, Shindo Muso Ryu (神道夢想流) is a traditional school of jodo.